In my last posting on the subject of the Civil War reunion photo, while naming several little towns near White Rock City where celebrants might have gathered for a group portrait, I omitted what turns out to be the prime candidate - Republic, or, as it was called then, Republic City, which lies about 8 miles east of what fragments remain of White Rock. Of the various military get-togethers held between 1885 and 1887, Republic was the site of the only one where we know for sure that Thomas Lovewell actually showed up. Surprisingly, it was not a G.A.R. encampment or even a reunion per se - just one of the regularly-scheduled twice-monthly meetings of Billy Hughes Post No. 310*. A few years back, when I first began sifting through hard evidence about Thomas Lovewell, I spent most of one futile day at the Center for Historical Research at Topeka, cranking through reels of microfilm of the Republic City paper while on another dogged mission to pin down a legend. I’ve always enjoyed the story of Thomas Lovewell popping up suddenly at the 1900 Old Settlers Reunion, only moments after Lydia Charles, filling in for an ailing Thomas Shuler, has finished eulogizing him as a supposed casualty of the gold rush at Cape Nome. In the spring of 1899 Lovewell had headed for Seattle to board a steamer that would take him to Alaska, and nothing had been heard of him since. According to his family, upon arriving home he headed straight for the reunion grounds. Even his wife, who had been staying with one of their sons, was unaware of his return. I expected to find the anecdote breathlessly recounted in local press reports about the reunion at Babcock Grove, but could never turn up the slightest mention of it. The Republic City News looked like my best hope, since Lydia Charles was not only the mother of Gomer T. Davies, but associate editor for the News. Gomer had moved on to helm a paper at Concordia by then, leaving the News in the capable hands his half-brother Tom Charles and their mother. Now that issues of the paper are online and searchable by keywords, my long vigil was finally rewarded by an item in the September 7, 1900, edition of the paper. That’s all. No mention of Lydia Charles’s woeful recitation of the horrors encountered by hapless prospectors at Nome, or of Thomas Lovewell’s surprise appearance contradicting her worst fears. I’ve long suspected that the tale as we’ve always heard it was never reported as a human interest story, because it was instead something of a prank cooked up by Thomas Lovewell and his old buddy Thomas Shuler, who was President of the Old Settlers Association. If we are to believe the item printed in the News, Lydia Charles didn’t even speak at the event. 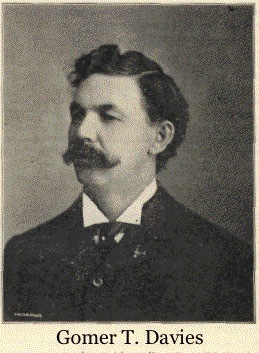 Thomas Shuler gave the welcoming address, as advertisements had promised. Ah, well. History is sometimes reluctant to give up her secrets. At least we can now be certain where and when that photographic record of a gathering of old soldiers was taken, and who some of the faces belong to, although matching names with faces is another matter. The three who can be named are seen in this detail taken from the wide shot, which can be found here. A post roster created in 1884 gives Jesse Helfer’s age as 63, making him a good candidate for being one of the white-bearded veterans. C. F. Litsinger was about 65 in 1885, possibly the man behind the other white beard or perhaps one of the prosperous gentlemen on the front row, who evidently were not, as I had guessed earlier, distinguished visitors, but merely some of the post’s senior officers. If W. H. Mosher is the “Jim” Mosher so skilled on the snare drum, he may be the helmeted soldier standing next to sometimes-Chaplain Daniel Davis. Mosher and Davis were previous acquaintances, having transferred from Scandia’s General Lew Wallace Post. Some of the other names represented are Phil Grigsby, Jacob Beck, H. S. Stone, R. M. James, J. T. Patterson, George Barr, A. B. Vance and James Calder, the post's surgeon, but a plasterer by trade. Two more White Rock residents, A. B. Ogle and Willard Woodruff, are in the picture somewhere. Courtesy of Gomer T. Davies and a portrait posted on Findagrave.com, we can be absolutely certain that the picture was taken at a gathering of Billy Hughes Post 310 at Republic City. 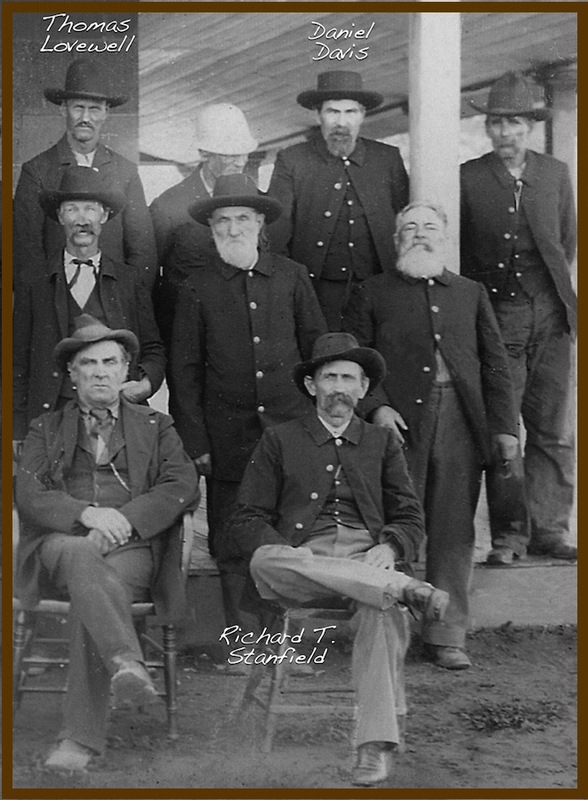 A third identifiable man in the photograph is Richard Thompson Stanfield, formerly captain of the Salt Creek Militia, and a born leader who was frequently elected commander of Post 310. He is the self-confident figure casually in charge of the meeting, seated at the lower right corner. *Named for Sgt. William "Billy” Hughes who died in 1883. Hughes had been in Andersonville Prison for 16 months during the war, and was a charter member of John Brown Post 44 in Belleville.